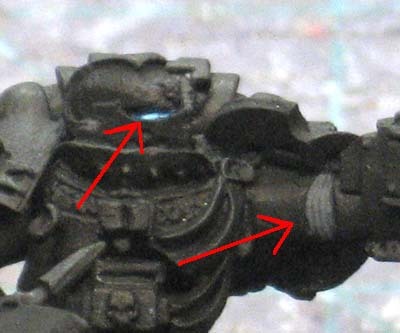 I know, this is one of those Forge World heresy heavy weapon guys and this is a post about helmet lenses. But to be honest, that was the first thing I saw on this guy. I'm not a big fan of the weapon conversion (in fact I think it's horrible), but I love the subtle look to the helmet lenses done here. When I paint my helmet lenses, I normally go much brighter overall. Here's the process I use (and even more important is when you paint them), but after seeing how the Forge World guys went with the much more muted look, I'm considering changing how I paint mine. Now I do have a method I use when I want them to appear as though they are glowing and that is done by painting the whole lens a bright color and then washing it with a similar shade followed by a bright highlight in the very center of the eye to simulate the glow. The Grey Knight troop above shows the effect. I used a bright blue-green color for the base color, wash it with GW Drakenhof Nightshade and then add a tiny bit of the original base color back into the center of the lens as the highlight. I do like this look, but I don't like to use it all the time. I already try to push the contrast when I paint my gems. I try to work from black all the way up to the bright reflected light on the bottom inside surface of the gem. 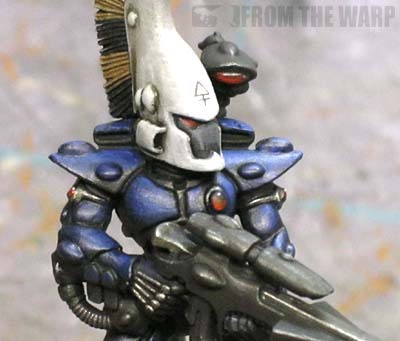 if you look at the gem on the chest armour of the Eldar Guardian there, you can see what I mean. I think I'm going to try and apply this higher contrast look to my helmet lenses from here on out. Instead of painting the lens a solid base color like I've done so far, I'm going to treat them like gems and work on adding that subtle reflected light along the bottom edge. I don't see it saving me a ton of time, but I do see it giving me a better look overall and making the lenses appear more like glass instead of some non-descript material. I use your method Ron and I think its better than the forgeworld look. 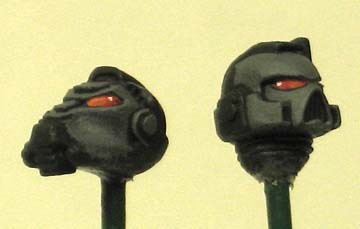 In fact I'm not a fan of their current paint style all weathering and no shadow/highlights, they look very flat. 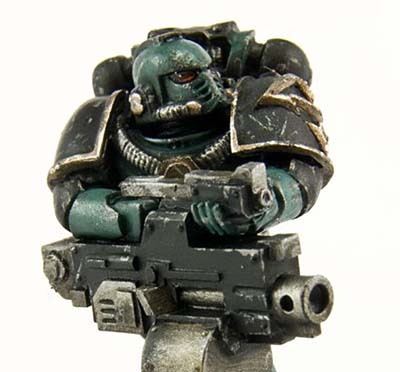 I agree about the heavy bolter, it looks like he's holding a standard bolter with a heavy strapped underneath and a dustbin underneath that. Very lazy sculpting. I do like the effect on the top image. I think it comes down to whether you''re going for a "grimdark" paint job or a cleaner effect like the GW product images. I've painted them that way for as long as I can remember (though I can't remember if it was a conscious decision, or just something that happened to work!). It can take a little extra time, and it increases the chances of a mistake, such as straying onto the helmet highlight - after all you're doing multiple layers on what can be a really tiny area on some miniatures - but it's worth it in my mind if you want to stand out a little. As an aside: the Heavy Bolter I'm on the fence about. It's just the fore grip which lets it down for me, but I understand why it's like that - so they could re-use the standard Bolter arms and not sculpt a set-specific part. Staying off topic for a moment, I agree the heavy bolter looks wrong. Might look better if the gap between between the barrel and the grip was closed maybe? Coming back on topic the lenses are the best part of that Forge World paint-job. I realise it's a close-up but it looks a bit 'slap dash' to me. rob82: I'm with you on the weathering and such. You'd think the guys who wrote the masterclass book would put out something a little nicer. Chris: Good point, it does depend on the look you're shooting for so to say. the unrealistic artist: "Slap dash" is a good way of saying it. I find myself wishing there was more. The sculpts are generally gorgeous and then a paint job like this... kind of a letdown. I agree the paint jobs are not the best, but a common complaint about FW is (or was) that they never paint any of their new releases, and given they have a lot of legion stuff to paint its only natural they would go for quicker painting methods. Another side effect of this could be helping the "too scared to paint" syndrome they hear about a lot, if the minis look like they have achievable paint schemes then perhaps more people will actually paint them! Bigglesworth: I can see them going for the quicker method, but sometimes it looks slapped on more than "painted" with any real effort. I know that might sound mean, but they are gorgeous models and I'd love to see them done well. And the whole thing with them using regular arms... that's kinda disappointing really. There is so much that could be done with them and to go the route of "this will make it easier/cheaper" is sad. On the topic of eye lenses have you tried true metallic metal eye lenses? I've probably played to many futuristic Sci-fi shooters, but I certainly think gold or silver visors/ eye lenses would be interesting. I've had a bit of an experiment before with some high quality gold paint designed for airbrushing (and people who can't smell anything!) and its certainly an interesting look since the reflection is real, rather than an effect, though I suppose thats a taste thing. I imagine it could be a tradition thing stopping people from trying it, I.e if the chapters always had red or green eye lenses it would be heresy to change them, but I would imagine gold would be an acceptable alternative to yellow or orange lenses for example. I do like the effect, but I have one question... What tool do you use? Anytime I have tried to do anything with any lense, I make it look like crap cause it is too small. Do I need a smaller brush/more patience? For right now, I am just using Nuln oil, and it works for my brighter color scheme, but this would be good to know. Awesome post! Bigglesworth: That's a killer idea! I never thought of doing that. I kind of try and make my lenses a contrasting color for effect, but I really like the metallic idea. HiveTyrant36: A "good" paintbrush, steady hand and thinned paint. I use a Raphael 8404 Kolinsky Sable Brush - Size 0. It's the only thing I paint with too. Once the tip is gone, they get retired to basecoat work. i think my big issue with the top picture is that the lenses are so dark, from any sort of distance they'd just merge into the helmet. realism be damned, i'd want them to be noticeable. I tend to do mine as a simple basecoat, wash to deepen the edges and then a narrow highlight in the centre, to try and make them look slightly "bulged" rather than flat or recessed. not a fan of the Bolter either, much like everyone else. interesting idea for a grip, but could have been more interestingly implemented. Bigglesworth: Nice, I may snipe that, especially for my Space Wolves. Matt Farr: That's a good point. You might be able to pick out the bottom highlight at a distance depending on the light. Faolan (Jake): Thanks. I thought I'd mention this FW model to show that even something as simple as helmet lenses can be done in a number of ways. There never seems to be an end to the ways something can be painted. Great ideas here, I much prefer the brighter highlights on the lenses. That might just be coming from a noob painter but since most marines I paint end up dark, a little contrast here and there is great.